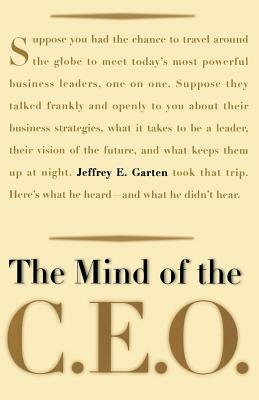 Based on extensive and highly personal interviews with forty chief executives around the world-among them GE's Jack Welch, AOL's Steven Case, Intel's Andy Grove, Newscorp's Rupert Murdoch, BP Amoco's John Browne, Nokia's Jorma Olilla, and Toyota's Hiroshi Okuda-The Mind of the CEO takes us on a journey into the innermost thoughts of today's corporate titans and paints a compelling picture of the strategic and daily challenges facing them. Jeffrey Garten's findings are a challenge to those who are suspicious of corporate power, those who believe CEOs should focus only on enriching shareholders, and even to many CEOs who see their jobs much more narrowly. No one interested in the future can afford not to read, think about, and debate this book. Jeffrey E. Garten is dean of the Yale School of Management. He served as U.S. Under Secretary of Commerce for International Trade from 1993 to 1995, and was previously a managing director of the Blackstone Group, a Wall Street investment firm. He is author of A Cold Peace: America, Japan, Germany and the Struggle for Supremacy and has written for the New York Times, Wall Street Journal, Foreign Affairs, and Harvard Business Review. He and his wife, Ina, live in Connecticut and New York.